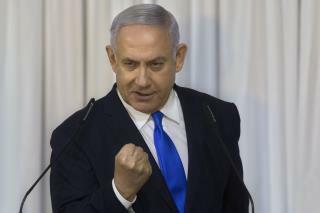 (Newser) – Israel's attorney general on Thursday recommended indicting Prime Minister Benjamin Netanyahu with bribery and breach of trust in a series of corruption cases, a momentous move that will shake up Israel's election campaign and could spell the end of the prime minister's political career. Attorney General Avichai Mandelblit announced his decision after more than two years of intense investigations and deliberations, the AP reports. Police had recommended indicting Netanyahu for bribery, fraud, and breach of trust in three different cases that ranged from accepting expensive gifts from wealthy allies to allegedly trading influence for more favorable press coverage. The final decision on indictment will take place after a hearing at which Netanyahu is given the opportunity to defend himself. SURPRISE! JESUS SAID: "But he answered and said, I am not sent """ BUT """ unto the lost sheep of the house of Israel ."  Matthew 15:24 (KJV) [ """GENETICALLY ... ANYONE""" therefore, must somehow be of the house of Israel, not the house of Judah, to be a Christian.] Ye worship ye know not what: we know what we worship: for salvation is of the Jews .  John 4:22 (KJV) [Jesus said those words because He was Jewish; Moses was Levitical, not Jewish. Jews (Yehudis) didn't come along until Second Kings 16:6, a thousand years after Moses.] SUPPORT ISRAEL!!! Help make Israel great again...and all theirs ... and ours!! !